he panicky, led-bar-in-your-stomach feeling that you get when you make your way to the top of the very first drop of the rollercoaster is the worst. A deep regret forms in the pit of your throat, making those seconds to the pinnacle seem like an eternity. You tell yourself not to look down, but you do anyway. Once the linked metal carts chug themselves over the towering crest of the track, that led bar makes it’s way up your throat and manifests into a scream as your eyes begin to water. Halfway down, the worst has vanished and you feel weightless. You are flying. I’ve always wanted to fly and feel weightless. Forget about telepathy and super strength, flying would be my first choice if I were granted a superpower. It’s this feeling that makes that terrible gut-wrenching feeling all worth it. When you’re over 50 feet in the air, standing on a rickety platform with 12 other people it’s understandable to be a little ... shall we say concerned, even though you’re secured and harnessed, like in a rollercoaster. 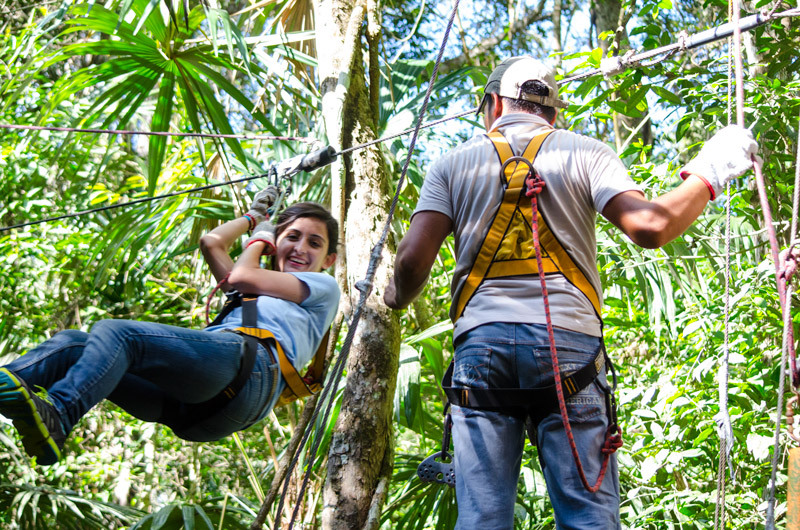 Zip-lining through the jungles of Guatemala is something that I got to write in my bucket list and check off. It’s also up there on the list of times where I almost had an anxiety attack, way above any time that I’ve been on a roller coaster. It’s hard to appreciate the beautiful scenery around you when you’re climbing a ladder and weighed down by a harness and ropes. It’s near impossible when you’re standing on that untrustworthy platform planning out what to do and what to hold on to in case it collapses. Then it’s your turn to ride that metal cable. You’re secured to the line by a hook, but if you’re a 5”1’ girl, you have to lift yourself to reach it, where you are suspended in an awkward and nerve-wracking limbo; not quite standing and not yet flying full-speed toward the end of the line. At this point I’m freaking out, trying not to display my fear. The guide asked if I’m okay and I can barely muster up a simple “Si”. He signals me to lift myself again and charge into the jungle. I start accumulating speed faster than expected as the air licks my face with a cooling effect. It’s the most liberating feeling in the world. I’m flying, granted without wings and without any superpower, but I’m soaring and I almost don’t care that the guide is messing with the line behind me trying to make me go faster. I plunge toward the end platform and at last have something below my feet. I am relieved, but that is soon shattered. We have about five more lines to travel down on and five more opportunities for disaster to strike. I’m waiting for my next flight and I notice abnormally large mutant ants, probably the size of a peanut, crawling up the trees. The stands, suspended high up in the trees, continue to sway which might just be my imagination. I reach the end of the last cable and plant my feet on solid ground with crazy, wind-blown hair, glad that I survived to tell the tale. I admit that I might’ve been over dramatic and my intention was not to scare anybody off from participating in such an activity. I cannot stress enough what an invigorating and rewarding adventure it was. Plummeting through the air, hanging from a single wire is something that should be experienced no matter how heavy that imaginary led bar might feel.